What is SQL Sentry Always On Monitoring? SQL Sentry Always On Monitoring helps you visually monitor and manage important information about your Microsoft SQL Server Always On Availability Groups (AGs). Introduced in SQL Server 2012, the Always On AG feature is a high-availability and disaster recovery (HA/DR) solution that provides an enterprise-level alternative to database mirroring. AGs support failover environments for discrete sets of user databases that fail over together. Each AG consists of a set of read-write primary databases and one to eight sets of corresponding secondary databases. Optionally, secondary databases can be made available for read-only access and/or some backup operations. Managing AGs with native tools such as SQL Server Management Studio (SSMS) can be quite challenging for a variety of reasons. For instance, depending on which replica you're viewing, you'll see different information about the status and health of an AG. This is because secondary replicas are not aware of other replicas. Only the primary knows the true status of all replicas. As a result, DBAs managing AGs with native Microsoft tools have to click around a lot to ascertain the accurate status and health information of all their AGs—which can become quite cumbersome and time-consuming in larger, multi-node AG setups. SQL Sentry Always On Monitoring allows an enterprise to visualize its SQL Server Always On environment in a whole new way. 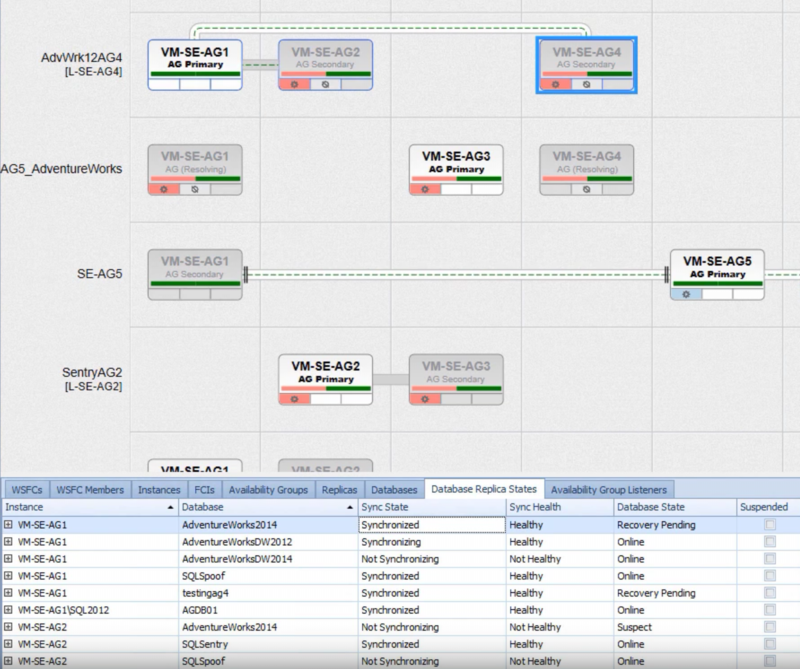 With three different ways to analyze your environment, you can stay on top of health status as well as configuration information in easy-to-read layouts. The Overview area in the AlwaysOn Management tab contains several layouts for managing your AG environment from several perspectives, including the Windows Server Failover Cluster (WSFC) level, the Availability Group level, the SQL Server instance level, and the Replica level. The layout style can be changed from a dropdown menu in the Overview area. When you monitor the SQL Server instance hosting the primary replica of an availability group with SQL Sentry, the entire topology of that availability group is displayed as part of the Overview area. Unwatched instances hosting replicas appear in a gray background color. You can zoom in or out of the Overview area to view information such as if the replicants are in synchronous or asynchronous commit mode; replica health; log send or recovery queue growth; quorum votes and the amount of data being transferred. Bottlenecks are highlighted in the environment by dynamically changing color and with changing flow lines for optimal insight into the health of your AG environment. View of a SQL Server production environment with current availability group topologies displayed in WSFC Node/Group Matrix layout mode. The Grid View section is composed of several tabs, which allow you to see both high-level and detail-level metrics concerning your AG environment—giving you a rich and easily navigable version of the entire AG schema. For example, one of the Grid View tabs allows you to view not only the SQL Server instance that a database belongs to, but its synch state; the database state whether it is in recovery pending, suspect, or online state; and much more. This section of the SQL Sentry AlwaysOn area contains tabs for charting, error logs, and replica state changes. Information in each tab is shown based on the selected time range. Each of the History tabs is context-aware and displays information based on the node or row selected in either the Overview or Grid View area. 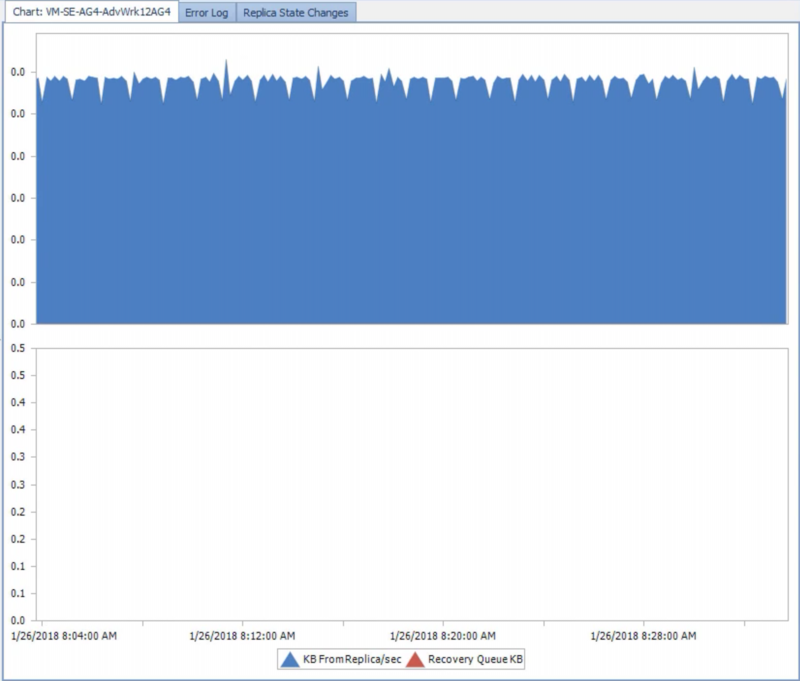 The Charting tab displays data traffic between the replicas as well as the log send and recovery queue metrics, in kilobytes. The Error Log tab allows you to view AG health events that are classified as errors related to the selected node from the Overview or row from the Grid View area. The Replica State Changes tab enables you to view any AG health events that are classified as replica state changes related to the selected node. 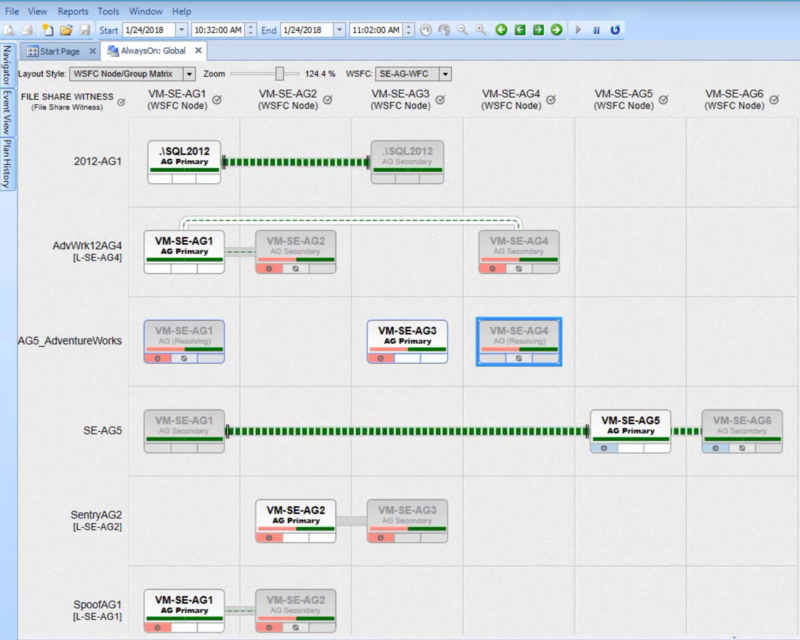 Ready to watch a 90-second primer on SQL Sentry AlwaysOn? You can use the built-in failsafe conditions to notify you when replicas become unhealthy and availability groups fail over. Alternatively, you can write your own alerts and responses using SentryOne's powerful advisory conditions framework. For example, you can calculate whether all of the databases in an Availability Group meet your Recovery Time Objective (RTO). "The [SentryOne] visualization of AlwaysOn Availability Groups is quite helpful and being able to see the volume of data helps determine hot servers."